The cooling system in your BMW does more than just keep the car from overheating in the summer, or freezing in the winter. 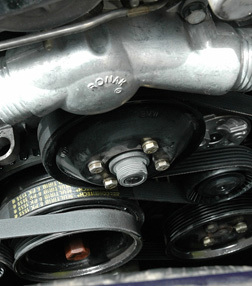 The coolant in the system also acts as a lubricant and helps protect the integrity of your radiator and engine. If you notice a coolant leak, bring your BMW in immediately for repair before any damage is done. Even cooling systems that appear to be working normally should be serviced every two years, at a minimum, to keep you from being stranded in an overheated car, and to protect your engine. At Dobson’s German Auto Service, we also recommend regularly pressure testing your cooling system, which will expose potential problems that are not easily detected by visual inspection.